Mainz is the capital city of the state of Rhineland-Palatinate in Germany. Once the episcopal seat of the influential Prince-Electors, the "civilized" origins of Mainz date back to around 38 BC, when the Romans built a citadel here, named Mogontiacum. It was founded by the Roman general Drusus, brother of emperor Tiberius and father of emperor Claudius, at the strategic confluence of the Rhine and the Main; it shortly became the provincial capital of Germania Superior. Drusus died while campaigning beyond the Rhine, in the summer of 9 BC; his body was brought here to be mourned, and a massive funeral monument dedicated to him was built. The so-called Drususstein still stands (although unclad of its marble) inside the citadel of Mainz. The city's location at the confluence of the Rhine and the Main rivers is ideal for trade, something reflected by the artifacts kept in the Landesmuseum, that show there have been settlements here since 300,000 BC. The most logical starting point is the Dom, the Cathedral of St Martin and St Stephan, especially on Tuesdays, Fridays, and Saturdays, when the farmers' market is open. Although the cathedral was actually started in 975, most of what is seen today was built from the 11th to the 13th centuries. At the Dom und Diözesanmuseum in the cathedral cloisters, you can truly witness the opulence and wealth controlled by the Church in Mainz. Mainz is also the home of the man identified by Time Magazine as the most important individual in the last millennium, Johannes Gutenberg, the inventor of the moveable type printing press. Mainz is also the home of the music publisher Schott Music. Mainz has several train stations. The biggest and the only one in which InterCity and InterCityExpress trains do stop is 50.0014368.2591191 Mainz Hauptbahnhof (main station), it is on the western edge of the city centre and works as a general hub for local traffic. Another noteworthy station is 49.9937268.2777662 Mainz Römisches Theater (Roman theatre), south of the centre, but it is only served by regional and commuter trains. Both are served from Frankfurt, about 45 minutes way, by S-Bahn line S8. As of 2018, the cost of a single ticket on the Regional train (S-Bahn line S8) to Mainz Hauptbahnhof from the Frankfurt International Airport was 4.9 €. Some good offers to explore the surroundings include the Rheinland-Pfalz-Ticket, offering unlimited travel in local trains for up to 5 persons inside the states of Rhineland-Palatinate, Saarland and Wiesbaden. The ticket costs 24 - 44 € per day (as of Dec. 2015) if bought via automat or internet, or 26 - 46 € if bought at a ticket stand and is available at all train stations. For Hessen (including Mainz, but not the rest of Rhineland-Palatinate) exists the otherwise similar Hessenticket, costing 34 € per day. 49.9991478.2738411 Dom St. Martin (Mainz Cathedral), Markt 10, ☎ +49 6131 253412. Romanesque cathedral – one of Germany's oldest; others are in: Worms, Speyer. 49.9953298.2684932 Stephanskirche (Church of St. Stephan), Kleine Weißgasse 12, ☎ +49 6131 231640. Visited in part for its world-famous Chagall blue windows. 50.0071878.2663733 Christuskirche (Christ Church), Kaiserstraße 56, ☎ +49 6131 234677. Italian renaissance on the Rhine. 49.9956678.2782034 Sankt Ignaz, Kapuzinerstraße 36, ☎ +49 6131 224264. Leading from Rococo to Classicism. 49.9970128.2746255 Augustinerkirche, Augustinerstraße 34, ☎ +49 6131 2660. River Banks. Lots of restaurants and (night) clubs. 50.0010098.2769956 City Hall (Rathaus Mainz), Jockel-Fuchs-Platz 1, ☎ +49 6131 120. The city hall was built in the early 1970s by Danish architects, who used many tons Swedish marble for the façade. Considered modern at the time it was built, the city hall is not very popular today – many consider it too monumental, some even ugly. From the extensive city hall platform there is a beautiful view on the Rhine promenade and the river. 49.9980648.2679147 Schillerplatz. Beautiful, leafy square in central Mainz with the fountain said to represent the jesters and fun of Mainz's fastnacht celebration. 50.005278.2717368 Deutschhaus (Commandry of the Teutonic Knights), Deutschhausplatz 12, ☎ +49 6131 2082216. Now the Regional Parliament of Rhineland-Palatinate. 50.0069258.2705999 Kurfürstliches Schloss (Electoral Palace), Peter-Altmeier-Allee 1, ☎ +49 6131 242. The former city residence of the Archbishop of Mainz. It is among the most important Renaissance buildings in Germany. Today, the east wing houses the Museum of Roman and Germanic History. The 'Theodor-Heuss-Bridge' from Mainz-Kastel to the centre of Mainz. 50.0065948.27675710 Theodor-Heuss-Brücke (The Rhine Bridge) (between Mainz and Mainz-Kastel). 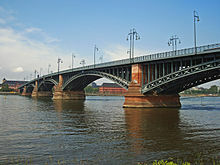 This is one of three Rhine bridges that connect Mainz with Wiesbaden and the state of Hesse. Like almost all other German Rhine bridges, the former bridge had been destroyed in World War II. The bridge was rebuilt in the early 1950s and named after the first president of the Federal Republic of Germany, Theodor Heuss. Kastel, a former Mainz suburb and several other villages on the right side of the Rhine, has been separated from the city after the war, as the Rhine was the border between the French and American occupation sectors. Even today, Kastel, Kostheim, Amöneburg, Ginsheim, Gustavsburg and the other former suburbs consider themselves part of Mainz, although they are administered by Wiesbaden and Hesse. 49.9997198.2753111 Gutenberg Museum, Liebfrauenplatz 5, ☎ +49 6131 122503, +49 6131 122644, fax: +49 6131 123488. Tue - Sat: 9am-5pm, Sun: 11am-3pm.. There are reconstructions of print shops and Gutenberg's hand press, an exhibition of incunabula, and the first two Gutenberg bibles are on display in a strong room. They also have a section devoted to the Far East with colored woodcarvings and prints from Japan, China and Korea. There is even an exhibition on the electronic future of books. Most displays have an English translation. You can purchase a guide in several different languages with your admission. Every hour or so, someone demonstrates how Gutenberg`s hand press works by printing a bible page on a replica of the press. Watching this demonstration is included in the entry fee. adults 5 €, children 8 - 18 years: 2 €, students: 3 €. 50.0062298.27026812 Römisch-Germanisches Zentralmuseum (Roman-Germanic Central Museum), Ernst-Ludwig-Platz 2 (In the former Electors'Palace: Kurfürstliches Schloss. ), ☎ +49 6131 91240. Tue-Sun 10AM to 6PM. Free. 49.9936988.28087713 Museum für Antike Schifffahrt (Museum of Ancient Shipping), Neutorstraße 2b, ☎ +49 6131 286630. Tuesday to Sunday 10AM to 6PM. Unique to Mainz is the Museum of Ancient Sea Travel, which contains the remains of five 5th century 6 Roman warship wrecks salvaged from the Rhine in the 1980s. True-to-life replicas were re-constructed based on these originals. Visitors also have the opportunity to glimpse behind the scenes in the research laboratory and in the museum’s workshops. These ships were found when the local Hilton was expanding its property. Free. 50.0012298.26800514 The Sacred Site of Isis- Mater Magna, Römerpassage 1. Monday to Saturday, 10AM to 6PM. A few years ago, when a shopping center now named Römerpassage ("Roman Shopping Way") was built, the construction workers found the remnants of what used to be a temple in the Roman city of Mainz. So, nowadays, you can visit this site inside the shopping center. It's surrounded by a quite interesting exhibition about the religious purpose of the Isis site. Free of charge. 49.9984098.2747115 Bischöfliches Dom-und Diözesanmuseum Mainz, Domstraße 3, ☎ +49 6131 253 344. Cathedral Museum & Treasury, Church art. 50.0037198.26800416 Landesmuseum (State Museum Mainz), Große Bleiche 49-51, ☎ +49 6131 28570. The Department of Antiquities traces the cultural history of the Rhineland from prehistory to the present. 50.0038988.27087917 Naturhistorisches Museum (Museum of Natural History), Reichklarastraße 10, ☎ +49 6131 122646. Go and explore the outdoor town market on Tuesdays, Fridays, and Saturdays at the cathedral. On Saturdays, local winegrowers sell their wines to visitors of the market. In the last couple of years this has become some kind of a tourist attraction. If huge crowds are no problem for you, you can have a lot of fun here (wine is sold until 4 p.m.). Visit the small but very pretty Altstadt (old-town) of Mainz. Located just behind the cathedral with a beautiful baroque church and a number of well preserved Fachwerkhäuser (Medieval style houses) to be seen. 49.9839558.2243281 1. FSV Mainz 05 (Opel Arena), Isaac-Fulda-Allee 5. Go to see a football match of the Bundesliga-club in it's new stadium. OPEN OHR Festival 2015  – May 22 - May 25 2015, Zitadelle Mainz, an alternative youth festival with some (mostly local) music acts and political or creative workshops and movie presentations. A three day ticket costs around €25. 49.9952438.2445451 Johannes Guteberg Universität (University of Mainz), Saarstraße 21, ☎ +49 6131 39 0. The student body is around 36,000. 49.9881258.2281122 Fachhochule Mainz (University of Applied Science), Lucy-Hillebrand-Straße 2, ☎ +49 6131 6280. 50.0007888.2694742 Thai Express, Franziskanerstraße 3, ☎ +49 6131 6299566. 49.9676198.2282643 Gutenberg center, Haifa Allee 1 (Just off the A60 - Mainz-Lerchenberg). In the shopping centre is a German Imbiss, small Asia Imbis, Turkish Imbiss, Chinese self-service restaurant, a Subway and German bakery. Across the road you will find McDonalds, Burger King and KFC. 49.996078.276729 Bodega, Holzstraße 10, ☎ +49 6131 224229, e-mail: bodega.mainz@googlemail.com. Hidden pub in a backyard. For decades, Betty (the owner) has been serving superb Spundekäs (a local speciality of Mainz), great banana wheat beer and German food. Meeting place for card playing clubs and a special recommendation at carnival and new years eve, since there are only people from Mainz in that place and you still have chances to get a seat. Prices are constant for a pretty long time, meaning that a Schnitzel still costs 6.90€. 49.9989458.27043510 Haus des Weines, Gutenbergplatz 3, ☎ +49 6131 221 300. Open late, they offer a great selection of wines to go with their delicious food that ranges from snacks to full meals and tends to focus on regional cuisine. 50.0106078.26682411 Geberts Weinstuben, Frauenlobstraße 94, ☎ +49 6131 611 619, fax: +49 6131 611662, e-mail: info@geberts-weinstuben.de. With an excellent wine list (heavy on German wines), Geberts offers excellent versions of traditional regional favorites, including handkäs-Suppe (cheese soup) and wildschwein (wild boar). They are closed for three weeks during the summer, on Saturdays, and at lunchtime on Sundays. 49.9970668.27416312 Gusto, Augustinerstr. 55 (in Frankfurter Hof), ☎ +49 6131 1 44 90 49. 49.9950578.27753214 Indian Tandoori, Neutorstraße 19, ☎ +49 6131 6271880. Very good Indian restaurant. 49.9954058.27725915 Ban Thai, Neutorstraße 18, ☎ +49 6131 220122. Good Thai restaurant. 49.996158.27394916 Zum Goldstein, Kartäuserstr. 3 (hidden in a side street of the Altstadt). Very pleasant beer garden raised of the street providing a little quite in the centre of town. Reasonably good but not outstanding food. 49.9680618.2407317 Asia World, Am Schleifweg 15 (Bretzenheim), ☎ +49 6131 3331249. Chinese, Japanese and Mongolian dishes. Lunch time all you can eat buffet. 49.9589658.21440118 Gaststätte Berghof, Marienborner Bergweg 33 (near ZDF Lerchenberg), ☎ +49 6131 330268. Good choice of German and Austrian dishes. 49.9860078.29071319 Schwayer, Göttelmannstraße 40 (in Volkspark), ☎ +49 6131 211211. Restaurant in the park. Beer garden in the summer. 49.9952578.27346620 Eisgrub-Bräu, Weissliliengasse 1a,, ☎ +49 6131 22 11 04. Open until 12:00, Kitchen until 11:00. 50.0169748.29260621 Mainz Kastel Brauhaus, Otto-Suhr-Ring 27, 55252 Mainz-Kastel (Located on the Otto Suhr Ring Road (Wiesbaden Mainz-Kastel), 2 blocks(right) off the main Hwy B455 going to Wiesbaden, from Mainz across the Theodore Heuss Brucke-1K. You can see the Biergarten's Umbrellas using Google Earth. ), ☎ +49 6134 - 24999. M-Th: 11-24; Fr-Sa: 11-1; Su: 10-23;. 49.9827518.16808727 Atrium Mainz, Flugplatzstraße 44 (Mainz-Finthen), ☎ +49 6131 491 0, fax: +49 6131 491 128, e-mail: info@atrium-mainz.de. 50.0001678.27570329 Heiliggeist, Mailandsgasse 11, ☎ +49 6131 225757. Church renovated into an up-scale bistro, they offer an abbreviated, but very creative menu that goes with an extensive wine list, including wines by the glass, that enable you to experiment wines from around Germany. Good outdoor seating. Beer quality not the best. Fiszbah, Raimundistr. 13, ☎ +49 6131 670330. Weekdays 7PM-late, weekends from 9AM. Legendary little dive bar with cold beer, interesting people and wildly diverse music (e.g. Discopogo for Punks in Pumps on Tuesdays). Limited food menu and breakfast/brunch on weekends as well. Hafeneck, Frauenlobstr. 93, ☎ +49 6131-4801977. neighborhood bar that manages to simultaneously cater to football fans, local hipsters and an endless streams of niche musicians ranging from the Whiskey Rabbi to Vicky Vomit. The kitchen (open 5-11PM daily) also serves up huge salads, a few German classics like schnitzel, plus giant savoury pancakes (Eierpfannkuchen) with unusual fillings, many of them vegetarian — try the Hades to add some spice to your life. Pourist, Heugasse 6, ☎ +49 171-4577339. A really nice spot in Mainz where it is allowed to smoke. Probably the best cocktails in town. Friendly barkeepers and guests. 49.9869118.2955111 Jugendherberge Mainz (Youth Hostel), Otto-Brunfels-Schneise 4, ☎ +49 6131 85332, e-mail: mainz@diejugendherbergen.de. Beautifully located between the river Rhine and the People's Park with two bus stops nearby. 49.9944888.2799622 Ibis City Hotel, Holzhofstraße 2, ☎ +49 6131 2470. 49.9964788.262123 Novotel Mainz, Augustusstraße 6, ☎ +49 6131 9540. 49.9899058.2895464 Favorite - Parkhotel Mainz, Karl-Weiser-Straße 1, ☎ +49 6131 8015-0. 50.0031748.2754055 Hilton Mainz, Rheinstraße 68, ☎ +49 6131 2450. 49.9958648.2807276 Hyatt Regency Mainz, Malakoff-Terrasse 1, ☎ +49 6131 73 1234, e-mail: mainz@hyatt.de. Incorporates Fort Malakoff, Mainz's 19th-century castle, into its 21st-century architecture. It's the only 5 star hotel in Mainz on the river Rhine. 50.0007358.2757813 Tourist Service Center (Touristik Centrale Mainz), Brueckenturm am Rathaus (On the bridge between Am Brand and the town hall. ), ☎ +49 61 31242 888. 49.9901538.2501494 St. Hildegardis-Krankenhaus (Hospital), Hildegardstraße 2, ☎ +49 6131 1470. Has walk-in emergency area. 49.9932988.2583255 Universitätsmedizin (University Medical Center), Langenbeckstraße 1. Bacharach in the Middle Rhine Valley is an extremly well-preserved medieval town right next to Rhine river, with a castle, which is now a youth hostel, overlooking the town. Trains from Mainz to Bacharach at least hourly, takes about 40 minutes. Frankfurt, take the S-Bahn S8 from Hauptbahnhof or S1, SE10 or S9 from Mainz-Kastel. Continue down the most scenic part of the Middle Rhine Valley towards Koblenz. Wiesbaden is just across the Rhine, take the S8 (13 min. ), the train RB (11 min.) or Bus linie 6 (30 min.). This city travel guide to Mainz is a usable article. It has information on how to get there and on restaurants and hotels. An adventurous person could use this article, but please feel free to improve it by editing the page.